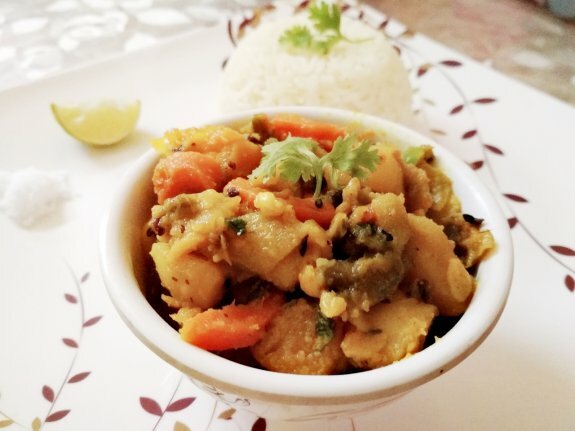 Mixed vegetable or Five vegetable medley is an authentic Bengali style dish known as Panch Mishali Tarkari. It is usually take with rice and dal. Know about this recipe and add it in your kitchen cook. Get more such recipe at our Bengali recipe section. 1. Grind the ginger and green chilli paste and keep this aside. 2. Heat oil in a pan and add asafoetida, panch phoron, red chilli, and bay leaves. Add turmeric powder and chopped tomatoes in the oil. Saute for 3-4 mins until tomatoes are soften. 3. Add all the chopped vegetables and mix it well. Add salt and cook for 8-10 mins on low heat on closed lid. 4. Once vegetables semi cooked add ginger and green chilli paste and cook it further for 5 mins. 5. Add little water if required and cook it well until water disappeared. 6. Add chopped coriander leaves and mix it well. Turn the heat off. Serve it with rice or chapatti too.